We just did our school shopping, and each time we do, I go through a bit of inner turmoil about choosing binders and notebooks. Do we go with the sensible, inexpensive plain ones, or do I allow my kids a little more individuality and choose more expensive, designer materials? Sometimes, it’s the most fun to be the designer! So when AstroBrights papers sent me this fun sample pack of bright colorful papers, I knew what we would do. One of the hottest trends in fashion and all over Pinterest lately, is color-blocking. Often, you see color blocking done with neon colors–neon being another huge trend. For my 7th grader, bright, fun and fashionable, seemed the perfect direction to head with her custom school binders. We purchased plain binders that have the clear plastic sleeve on the cover, so we could slide in our own cover creation. My daughter talked me into buying a couple of bright colored binders for fun. The third was plain jane white. She and I worked together flipping through the paper pack and picking her favorite colors. I explained to her some of my ideas about color-blocking and she had several of her own design ideas. For the white binder, we went with a really basic 3 color stack, in a tertiary color-scheme. To fill the entire width of the binder, we placed the papers down landscape orientation as we attached them to eachother. I cut off the edge with a papercutter, leaving a 1 inch strip to insert down the spine. I thought the binder looked great at this point, but maybe a little boring for my pre-teen, so since we were being so trendy already, I pulled out the washi tape. That added a bit of fun an whimsy, and made a great label for the binder’s info, so we wouldn’t have to clutter up the design with a lot of handwriting. The turquoise binder turned out to be my favorite. The colorblock trend was big in the early 70s, and my family has a picture (before I was born, of course) with my mom and sisters, wearing matching colorblock jumper dresses. They are very cute and stylish and done in this sort of way–with the varying sizes of rectangles. We made the base on white paper, that white would show through like a frame around each color. I like projects like these, were there isn’t a right or wrong way to do it. I started cutting rectangles and placing them, until I felt the design was balanced and fairly tidy, though not having it perfectly lined up gives it the human factor, and adds a little charm. Again, the washi tape, brought some fun and a way to label the folder. Purple is my daughter’s favorite color, and yellow is its complimentary color. So we knew this combo would make a striking design. After colorblocking the back ground, we just punched the flowers with a punch we had on hand and glued them to the paper randomly. Little sister–the one that wants to go to school, now!– wanted in on the project, too. This is what she designed for her invisible binder. She loved designing with all of the bright papers! Don’t you think these are way more fun than a $6 Justin Bieber binder? This could be a fun project to do with your kids and spend a little time together before they are back to school for the year! Big thanks to AstroBrights papers, for the bright inspiration! Their papers come in 23 bright colors, so you are bound to find the perfect one to grab attention for your project. It’s practical for business, like fliers and brochures, but also a lot of fun for paper crafts, or binder dividers–especially with the current neon trend. Bright and fun is just more bright and fun, right? AstroBrights papers wanted me to make sure and let you know about a great sweepstakes they have going on right now that can benefit YOUR child’s school! The Give a Brighter Year Sweepstakes gives you the chance to win $30,000 in supplies for the elementary school of your choosing! To enter, go to the AstroBrights papers Facebook page, click on the sweepstakes button and follow the simple directions they have for you there! 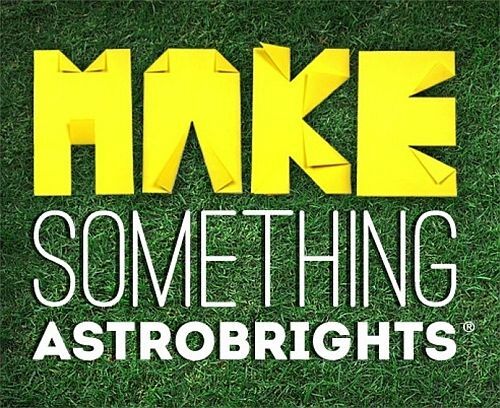 AND…for all of you crazy, crafty-types, AstroBrights Papers is hosting the “Make Something Astrobright” design challenges! All ages can use their creativity to come up with and submit projects for prizes! You can connect with AstroBrights Papers on Facebook, Twitter and Pinterest! Share your ideas using the hashtag #goastrobrights. Do you have any plans to spruce up your notebooks or binders for school? How do you feel about the neon and colorblocking trends? Did you buy any Justin Bieber notebooks this year??? These are adorable Kendra! What a great way for your kids to personalize their back to school supplies! Keep on updating your site! You have so much available and interesting information! I didn?t even notice how the day passed while reading it! Have a great time! Thank you!